Welcome to Como Town Amusement Park. Let's take a look around the park. Most of the park consists of kiddie rides so I will just label the photos with the rides' name. Hodge-Podge-Park - this area has an assortment of climbing structures, dig sites and caves to explore. It also has a splash pad included with admission. 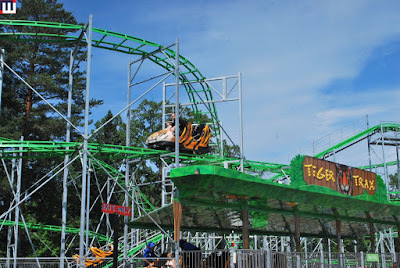 THE main reason I am here is for this coaster - Tiger Trax. I really enjoyed this coaster. Extremely smooth. Also, a major upgrade from the coaster that used to be there. My only complaint is the brakes on very hard at the end of the ride. On the way out, I took a ride on the Carousel that is at the entrance to the zoo. It has a lot of ornate animals on it. Beautiful piece of artwork.